Phillip, I'm make the argument that the reason they keep you is because you aren't a threat and you raise your hand and say "I'm a huge threat, I just haven't had the right challenge yet". If I make the wrong decision, 32 days of hard work could be gone, just like that. Phillip's terrible in challenges and he's a goat. Permalink: Phillip's terrible in challenges and he's a goat. Straight back to normal Felipe. Permalink: Straight back to normal Felipe. 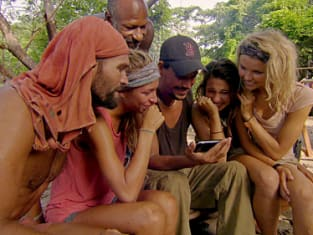 We're all completely set to get rid of Andrea and then all of a sudden Phillip regains his spot in the tribe as annoyance number one. The lovers are going to be reunited. Permalink: The lovers are going to be reunited. Oh man, my legs are like Jell-O. Permalink: Oh man, my legs are like Jell-O. I asked God to help me win and I think that's what he asked of me. Boston Rob: Thank you, Mike. Mike: You're welcome. Don't vote me out again. Permalink: Thank you, Mike. You're welcome. Don't vote me out again. Andrea: Are those happy tears or sad tears? Natalie: I don't know. They're hormone tears. If one of us Zapatera members gets in to the top three, we've got this thing one. I wanna be that guy.